The Green Party of Connecticut ran 30 candidates in the elections held this past November and saw 12 endorsed candidates win office. Although an off year for statewide elections, the state had many municipal positions open. If Greens start to make serious inroads in getting candidates elected to political office, it will probably begin in a state like Connecticut, where in a relatively small city there can be many offices available for which to run. GPCT currently has eight chapters with two more in formation. Each chapter controls its endorsements in its local town or county chapter, with five chapters putting forward candidates. The GPCT website lists dozens of Greens serving in positions in municipalities. Many are voluntary, but before this election GPCT also had eight people in elected offices. In this author’s state of Delaware, with exceptions for non-partisan elections of boards of education or small, non-partisan town councils, or the totally Democratic-party-controlled city of Wilmington, everything is run at the county or state level, making it quite expensive to run a serious cam­paign. Political appointees make many decisions with little public participation. But in Connecticut, citizens can not only run for partisan election on school boards or small city councils, but for boards of finance, zoning and planning, assessment, fire department commission, or constable. Such a situation allows Greens to run small campaigns that can reach most constituents without great expense. In Waterford, the town committee endorsed nine candidates. A couple of these candidates were registered Democrats with the rest being Greens. The Democratic Party also endorsed all of these candidates. The GPCT does not allow cross-endorsement on the state level, but chapters may do so. Ronna Stuller, Secretary of GPCT and Chair of the New London Town Committee opines, “To me, it’s an absurdity that we ever feel the need to engage in this sort of game playing, but for now it’s one of the very few ways we can level the field.” It appears that Connecticut Greens choose these alliances with the party that is out of power as Republicans control Waterford. On the other hand, in New London Mirna Martinez won a seat on the board of education two times with an endorsement from the Republicans. Martinez is running strictly as a Green this time. Of the nine Waterford Town Committee endorsed candidates, seven were elected. Waterford has four Town Meeting Districts, but each district elects five or six people. 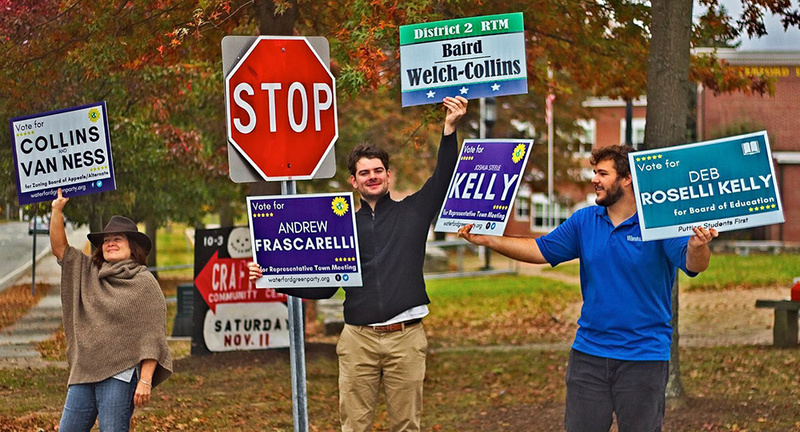 Greens elected one person in each district: Andrew Frascarelli (1st district); Baird Welch Collins (2nd); Joshua S. Kelley (3rd); and Carl D’Amato (4th). Darcy Van Ness was elected to the Zoning Board of Assessment. All of these candidates received endorsements from the Democratic Party. Two Democrats, endorsed by the Green Party, were elected: Deborah Roselli Kelly to the Board of Education and Michael Buscetto to the Board of Assessment Appeals. Two Green candidates for the Board of Finance, Kevin Kelly and Bill Collins, were not elected. In Windham, the most prominent of its Town Committee’s six candidates was Jean de Smet, who ran for Mayor. De Smet, who was the running mate of Cliff Thorton’s gubernatorial bid in 2006, won the seat of First Selectman, now retitled Mayor, in Windham in 2007. This time, in a four-candidate race for Mayor, de Smet lost with 37 percent of the vote, with 41 percent going to the Democrat, who was also on the Working Families ballot line. Other Green Party candidates in Windham were elected in multi-position races: Douglas Lary (Board of Finance, 20 percent), Cassandra Marineau (Board of Education, 11 percent, and Mike Westerfield (Board of Assessment Appeals, 17 percent). Corey Krohn (Town Committee, 13 percent) was not elected. In Fairfield County, none of the Green candidates won. Hector Lopez was seeking re-election as Constable in New Canaan, while John Amarillo was another Constable candidate. In Stamford, Brian Merlen ran for Board of Representatives, Jackie Pioli for Board of Education, and Cora Santaguida for Constable. Leif Smith lost re-election for Constable in Redding. Mirna Martinez, a previously twice-elected New London school board member sought re-election. In two previous elections Martinez received the endorsement of the Republican Party. This time she ran solely on the Green ballot line. The election featured 15 candidates running for seven seats. Each voter could only vote for one candidate. Martinez won a seat with 1,160 votes, 7.2 percent of the vote, compared to the highest vote getter receiving 9.3 percent. Erick Carrion, also running for a school board seat for the first time, was not elected with 730 votes (4.5 percent). The Shoreline Chapter, newly formed this past spring fielded four candidates. In the town of Madison Charles Owen got 12 percent running for the Board of Finance, while Michael Abbondanolo received five percent for a Board of Election seat. In the town of Clinton Hugh Birdsell ran for Board of Education while James Connolly ran for the Planning and Zoning Commission. None were elected. Overall the Green Party of Connecticut is gaining ground for local political offices. In this election it added a total of nine newly elected candidates, plus Mirna Martinez’s re-election and the cross-endorsement of two elected Democrats, while losing two elected positions for Constable.